His dwelling is called Himinbjörg (“Sky Cliffs,” connoting a high place ideal for a fortress), which sits at the top of Bifrost, the rainbow bridge that leads to Asgard. He requires less sleep than a bird. His eyesight is so keen that he can see for hundreds of miles by day or by night, and his hearing is so acute that he can hear grass growing on the ground and wool growing on sheep. Here he watches and listens, holding at the ready the horn Gjallarhorn (“Resounding Horn”), which he sounds when intruders are approaching. During Ragnarok, the gods will know that their doom is at hand when they hear the dire call of Gjallarhorn signaling the imminent arrival of the giants, who will cross the rainbow bridge to storm Asgard and kill the gods. The disloyal Loki, the particular nemesis of the unwaveringly dutiful Heimdall, will be with them. Loki and Heimdall will slay each other as the world burns and sinks into the sea. Taken together, certain verses in Old Norse poetry seem to indicate that Heimdall was once considered to be the father of mankind, and possibly to have established the hierarchical structure of Norse society as well. Heimdall himself is, like so many of the Norse deities, a son of Odin. In a feat possible for gods but not for biological creatures, he was born from no less than nine mothers. Some scholars have attempted to equate Heimdall’s nine mothers with the nine daughters of the sea giant Aegir, but this interpretation faces the difficulty of the names of Heimdall’s mothers not matching those of Aegir’s daughters. Apart from the above, the sources for our current understanding of Norse mythology offer only tantalizing scraps of information on this evidently once very important god. 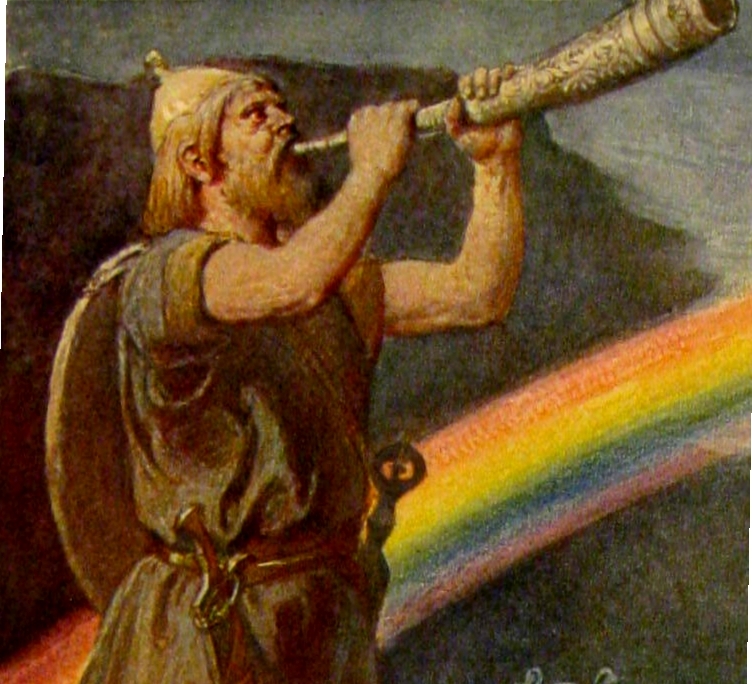 For example, Heimdall is often associated with the ram, but, despite a number of interesting yet ultimately entirely speculative interpretations from various scholars, the connection is unclear. A notoriously enigmatic verse in one Old Norse poem states that Heimdall’s hljóð is hidden beneath the world tree Yggdrasil and is somehow associated with the eye that Odin sacrificed. The word hljóð has a wide variety of meanings, and could equally plausibly refer to Gjallarhorn, Heimdall’s hearing in an abstract sense, or his hearing represented in concrete form as an ear. Did Heimdall sacrifice one of his ears for some great reward, much like Odin did with one of his eyes? We simply don’t know. Turville-Petre, E.O.G. 1964. Myth and Religion of the North: The Religion of Ancient Scandinavia. p. 153. Snorri Sturluson. The Prose Edda. Gylfaginning 27. The Poetic Edda. Völuspá, stanza 1. The Poetic Edda. Völuspá in skamma. Simek, Rudolf. 1993. Dictionary of Northern Mythology. Translated by Angela Hall. p. 135-136. Turville-Petre, E.O.G. 1964. Myth and Religion of the North: The Religion of Ancient Scandinavia. p. 151-152.